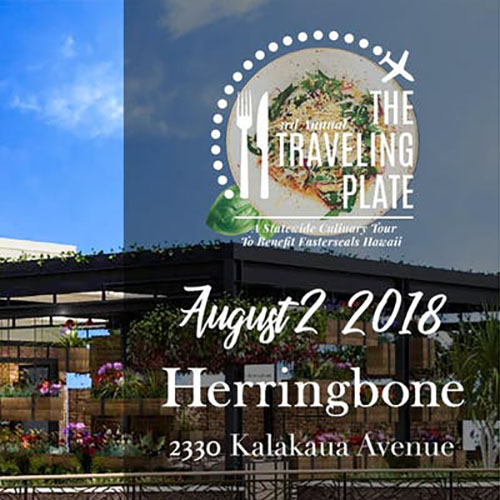 On August 2, 2018 join Easterseals Hawai‘i, in partnership with Herringbone Waikiki and host Executive Chef Raymond “Ray Ray” Locquiao for an evening of elegance on their Garden Lanai. Guests will delight in canapé from both the a la carte menu as well as one-of-a-kind creations by Chef Ray Ray including Oysters on the Half Shell, the famous Buffalo Octopus, Chicken Sliders, California Avocado Toast, a Bruschetta Bar. To add to the fun, we are excited to announce that this year Dave Power will be joining us as our featured mixologist. Libations will include a special signature cocktail for our VIP hour and perfect pairings for Chef Ray’s dishes as well as beer and wine. A very limited number of Chef Meet & Greet VIP tickets are available that will include early entry at 6pm with a handcrafted welcome libation, reserved seating in VIP area and additional chef selected bites including Alaskan King Crab, Whole Lobster, Jumbo Shrimp, Local Sashimi and Ahi Poke Flatbread. This event promises an intimate evening at the beautiful International Marketplace while giving back to an organization who provides vital programs that empower people with disabilities to live independent and fulfilling lives.